A good example of water repellency is how water balls up and rolls off of a leaf. Water will always try to stay in a spherical shape due to surface tension. When water comes into contact with the surface of your jacket, this spherical shape will break down and the water spreads out. If the surface of your jacket has a durable water repellent (DWR) treatment, bar-shaped water repellent molecules stick up from the fabric allowing water to maintain its spherical shape and simply roll off your jacket. The terms "water repellent" and "waterproof" are often confused and used interchangeably. This is due in part to the various water repellent sprays that are on the market. Most products that call themselves "waterproof", are in fact, "water repellent". These sprays can give cotton t-shirts water repellent qualities for a short amount of time, but they cannot make that same cotton t-shirt waterproof. These sprays may stop a fine mist from seeping through, but spilling a drink on the same cotton t-shirt won’t have the same effect as the treatment has very low level of water resistance. In other words, clothing that is only water repellent cannot completely stop rain or snow. 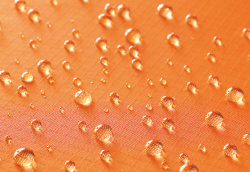 Water repellency affects a garment's breathability. The more your garment is worn, the more its DWR treatment is affected by dirt and friction. When a garment's DWR treatment becomes worn down, water is able to spread out over the fabric's surface, saturating it and blocking the membrane's pores. With the pores blocked, water vapor trapped inside is unable to escape. A hard shell with no water repellency can become saturated with water, becoming heavy and rob the body of its heat due to water's high thermal conductivity.